Location, Location, Location!! 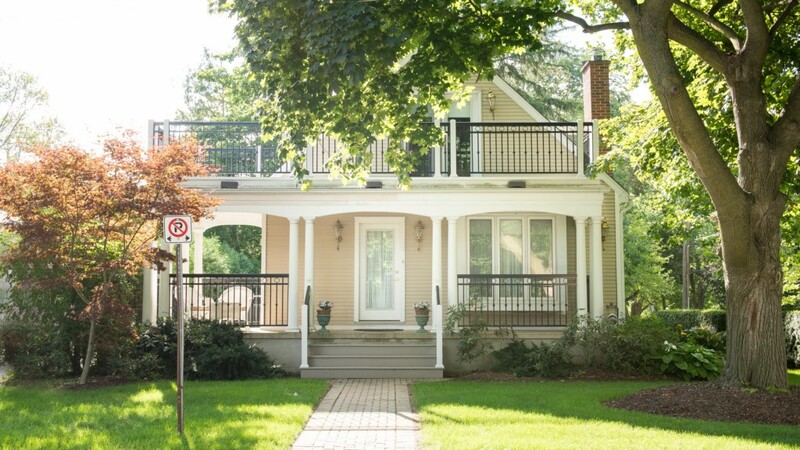 Governor's Walk is strategically located in the heart of Old Towne Niagara-on-the-Lake within easy walking distance of the Shaw Festival Theatre, Fort George, the Niagara River, Lake Ontario, and Queen St. shopping and restaurants. Governor's Walk features a Grand Room with a dining area, sitting area and fireplace, 4 bedrooms, 3- 4-piece ensuite bathrooms, a main floor 3-piece bathroom, and modern appliances. This is an ideal home for those large famililes or for couples who like to travel together and stay together. 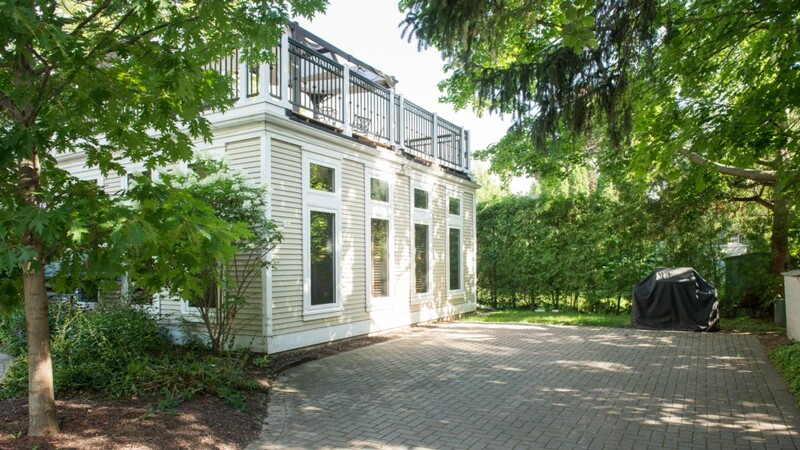 Governor's Walk has decks both front and back where you can relax and watch a horse and buggy stroll by, enjoy your morning cup of coffee or end your day enjoying one of Niagara's Finest Wines. The Grand Room provides the principle entertainment area in the home, ideal for visiting with family and friends. The Grand Room, located next to the kitchen, is a large open 24 ft x 17 ft room consisting of a dining area and a family/sitting area. The Grand Room is dominated by windows on three sides that allow the enjoyment of optimal natural lighting. All windows have wooden shutters to provide evening privacy. These shutters mirror the rich wood trim throughout this room. Enjoy fine cuisine in the dining area which contains a large table and 8 chairs. Built in cabinetry is adjacent to this dining table. The chef has an overview the dining area from the kitchen. 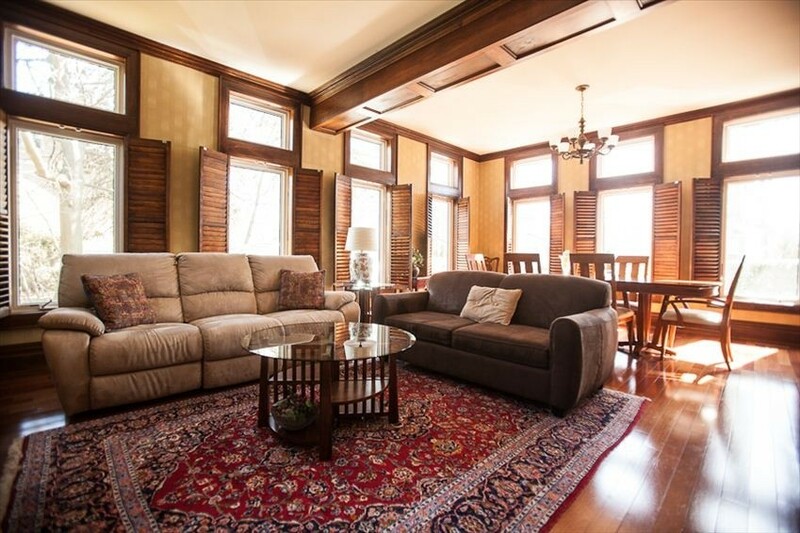 The floor is hardwood to complement the wood trim throughout this room. Relax in the family/sitting area, an informal space for gathering and has a fireplace, coffee table, sofa, ottoman, and chair. The floor is hardwood, partly covered with Persian carpet. The chef will enjoy working in the spacious fully equipped kitchen which showcases two working areas, one of which overlooks the Grand Room. 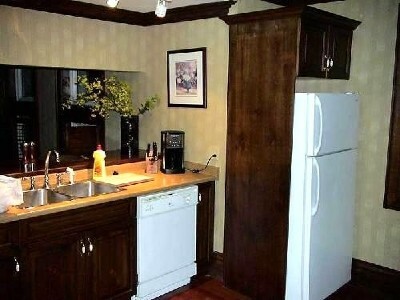 The kitchen includes a stove, fridge, microwave, dishwashe, coffee maker, and a host of smaller appliances. The elegant wood cabinets, trim, and floor match the Grand Room. The kitchen is fully equipped for serving 8 people. Enjoy the romantic atmosphere of the master bedroom suite, a large 24 ft x 20 ft room consisting of a sleeping area and a sitting area separated by a magnificent Chinese partition. The sleeping area contains a luxurious queen-size bed, a large armoire, and a complete 4-piece marble ensuite bathroom. 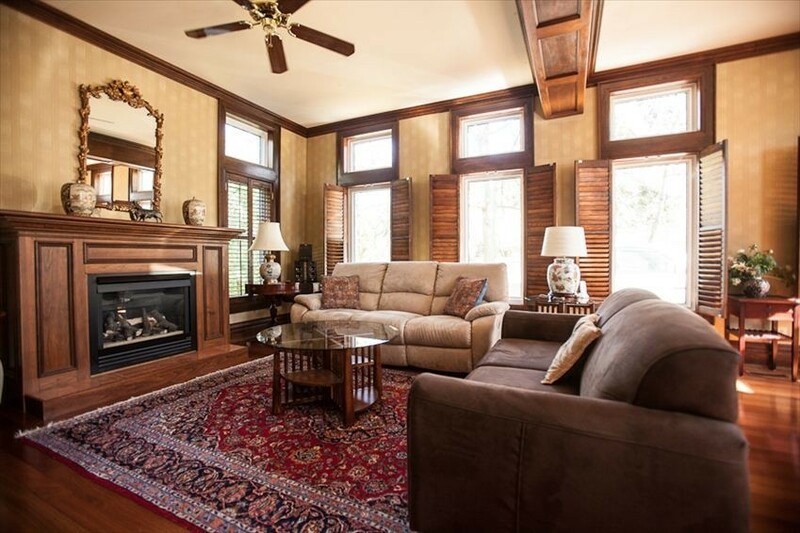 Relax and sip a glass of wine by the fireplace in the sitting area. 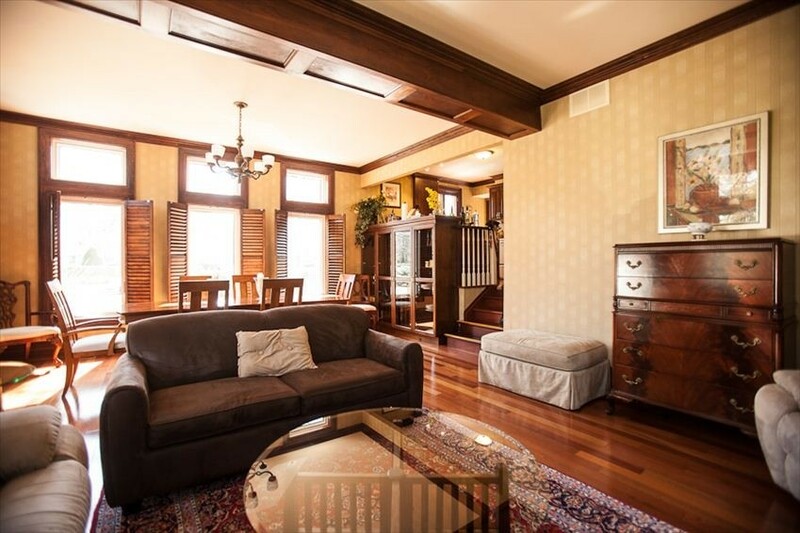 This area showcases a coffee table, 2 sofas, chair, writing table, TV, and DVD player. 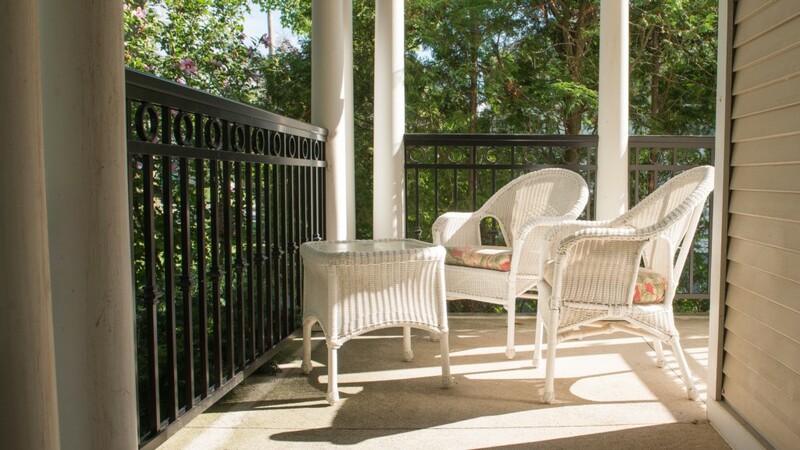 The front veranda is accessed directly from the master suite. Bedroom 2 is located on the main floor. 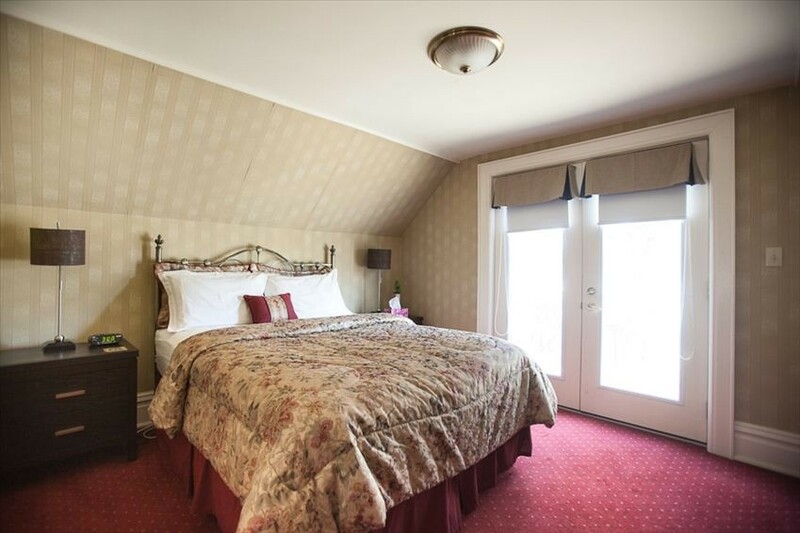 This room includes a luxurious queen-size bed and a dresser. A 3-piece marble bathroom with shower is located across the hall from this bedroom. Bedroom 3 is a large 24 ft x 20 ft second floor bedroom containing two luxurious twin-size beds, a dresser, a TV with DVD player, and a complete 4-piece marble ensuite bathroom. 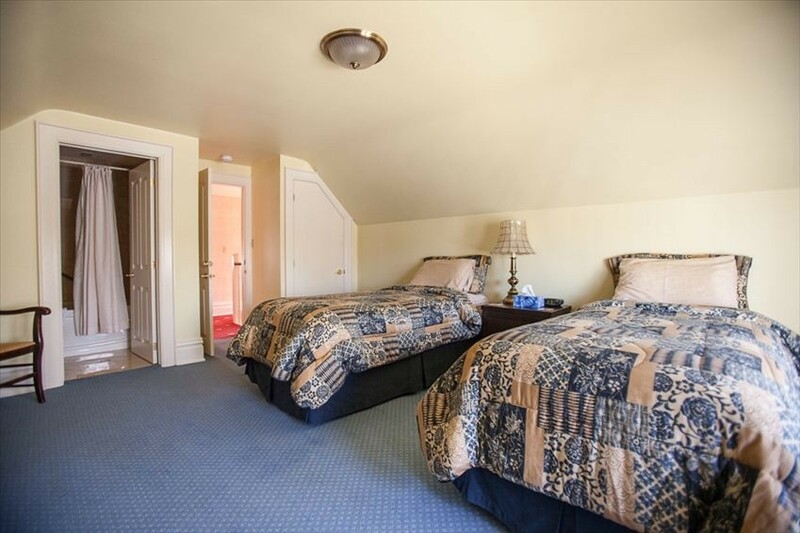 This bedroom has direct access to a large 24 ft x 10 ft upper deck overlooking Davy St. 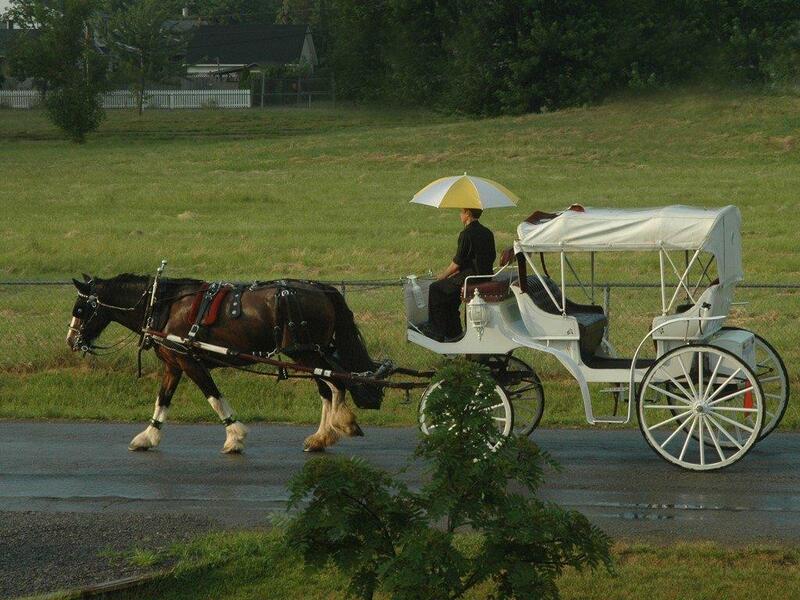 Relax and enjoy a glass of Niagara wine on the deck as you watch a horse and buggy stroll by. 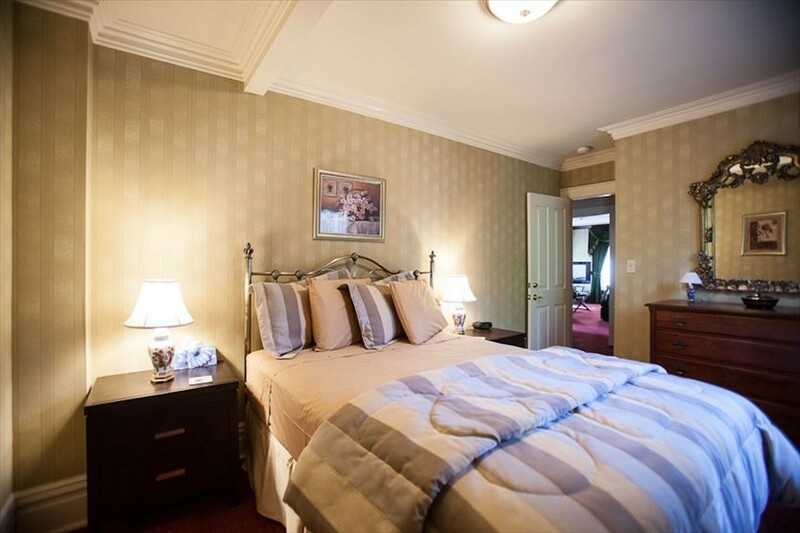 Bedroom 4 is a 24 ft x 20 ft second floor bedroom containing a luxurious queen-size bed, a dresser, a TV, and a complete 4-piece marble ensuite bathroom. 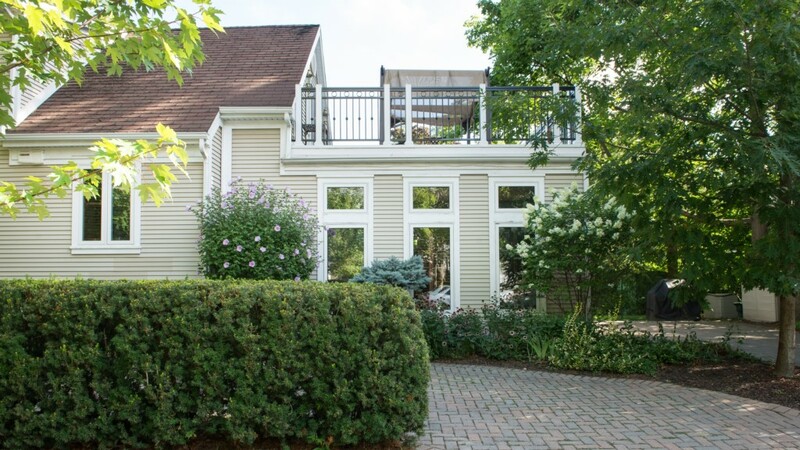 This bedroom has direct access to a large 24 ft x 17 ft deck with furniture and BBQ overlooking Platoff St. Relax in the shade, savour a cool drink, listen to the wind in the trees, and enjoy the cool breeze. •	No more than 8 including all children! Names of every house guest must be provided! Names of all children under 18 years of age must be provided! 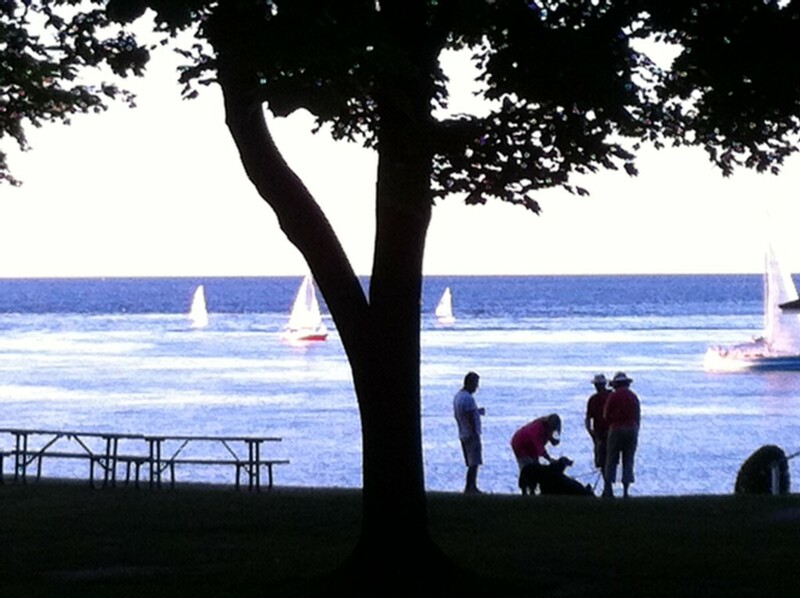 This information is require so we are complying with our license to operate a vacation rental in Niagara-on-the-Lake! •	Parking is available for 3 to 4 cars at your vacation rental. No overnight parking on streets allow in the town of Niagara-on-the-Lake! 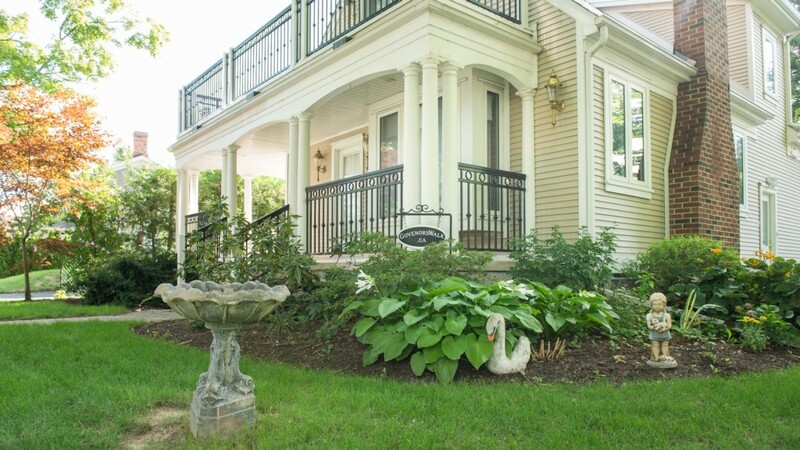 Call Janet today to book this grand home and start planning your vacation in Canada's Prettiest Town. This is a fabulous spot. Great location and well appointed. Very comfy with lots of seating and bathrooms. Will be back next year! Great stay at the governors walk. Lovely location and had everything we needed. Thanks for the quick response on dishwasher fluid! Governors Walk is exactly as pictured in the photos. Very charming, spacious and clean. Having a bathroom off of each bedroom was very nice for our group. 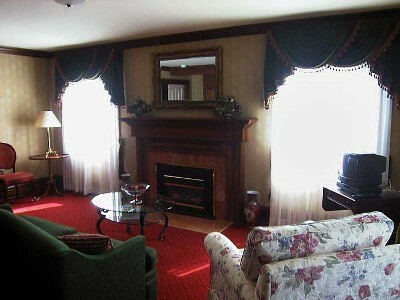 It is walking distance to the main shopping area and restaurants. I highly recommend this place if you are looking in NOTL! 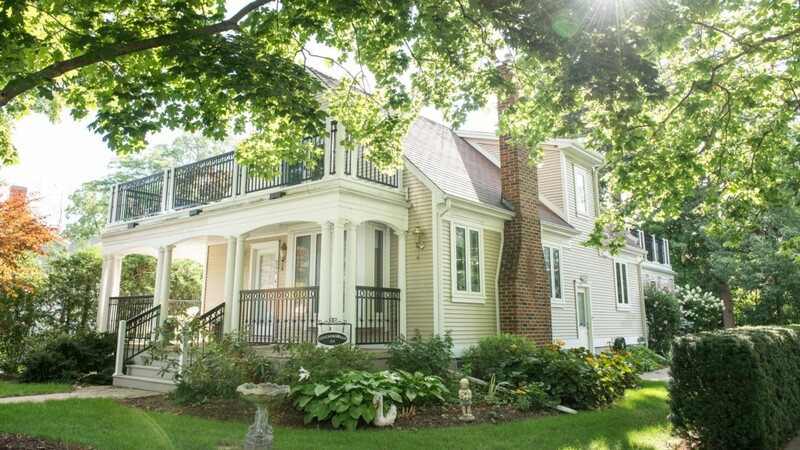 This rental is located in the heart of Niagara-on-the-Lake just steps from the main street. 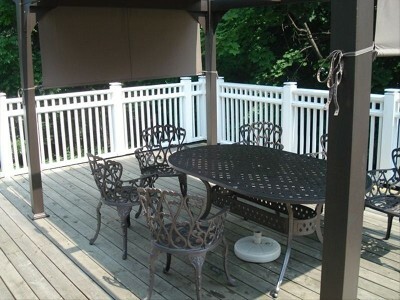 It is well maintained and equipped with everything a family could need for a long weekend stay. We enjoyed the traditional decor and apprechiated the two large family areas as we were travelling with our grown children. This allowed various generations to enjoy each other's company. I would definitely visit again! amily with adult children...we walked ur beautiful town ... Enjoyed the wineries, breweries , great stores and resturants ... House was amazing ... Location was perfect for exploring ! his was our second year at Governors Walk and just as impressive as last year. So much room for everyone! The house was so clean and location couldn't be better, we walked everywhere. As the organiser l received so much praise for finding this beautiful home and we will be back for sure. Also, let me say that dealing with the rental office (Debbie) has always been a pleasant and helpful experience.